I was hesitant to read the book at first because I’m afraid that I won’t like it. But as I read further on… I was mesmerized. The story is affluent and imaginative. It somewhat reminds me of Harry Potter, it’s magical! Also, the illustrations are superb! It’s lively and intricate and it truly depicts the theme. The story is a fairy-tale like no other. Gavaldon is plague by a mysterious thief, a thief that swiftly kidnaps children. Children that is ever lost and never to be found, unless one reads a story book. Sophie dreams of becoming a princess. She’s primed to be one, pretty and graceful. But does she have a good heart? Agatha, doesn’t like to socialized. She’s reserved and loves everything in black, a quality of a witch. But does the façade tell you who she truly is? Now the story took a warped turn when they found themselves being kidnapped and placed in a school for good and evil. Friendships will be tested and love will be found. Buy a copy now! The world-building is impressive! 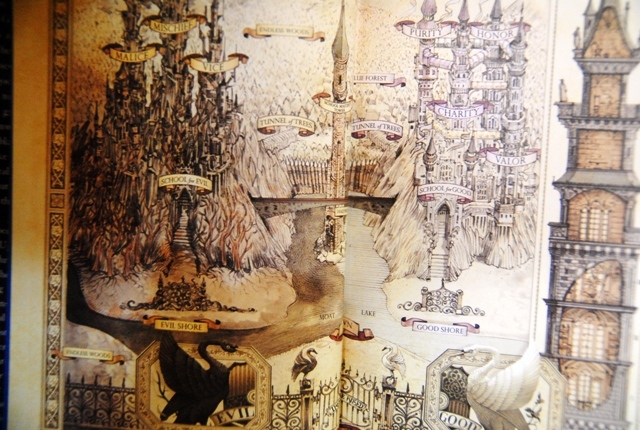 The book has a map of the school. It is very well made, colorful and mind-blowing. You get to see first hand the world Soman had created. The story is also told in third person. Imagine a voice that tells a magical story as you listen and get lost into the world. In my case, I imagined Gandalf’s LOL. Not a drop of boredom there! Soman took his time in describing and explaining the magical world, providing you with vivid imagery that will surely satisfy your imagination. I’ am blown away. Plus the humor is exquisite; there are loads of funny scenes that will tickle you, like these subjects: uglification, henchmen training, animal communication etc… put my old college subjects down to shame. What an interesting curriculum! What made this book shine are the lessons and realizations. I learned many things about friendship, trust and camaraderie. The characters are awesome! They are unpredictable in a way that will make you more curious to get to know them more. I also love that there’s character development. From spoiled to giving, timid to outgoing, monotonous to exciting, restraint to freedom...whew! The characters are diverse also. Sophie has the physical attributes of a princess, gold hair and alabaster skin. But her personality is in reverse, plastic to be exact. Agatha, is the epitome of an emo, in modern world. She hates drama and loves to wear dark colors. Two different girls put in opposing section. Which one is truly good and evil? Also the side characters are awesome! They gave the story a great depth. We have the prince charming, storian, friends and enemies. There is a wide array of personalities! The love-angle is okay. Not much highlight is given, it was confusing at first. But if you like a conservative romance portrayed innocently then this you will enjoy this book. 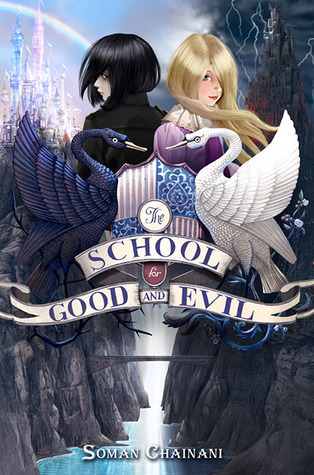 Overall, The School for Good and Evil is a nice read! I recommend this book for all ages who seeks adventure and humor. I give this, 4.5 not quite good and not quiet evil whales. Oh my gosh, Dani, this sounds good! And that map?? I love! I trust you when you say that the world-building is superb. :) I will check this out! Thank you for the great review! Everytime I hear about this book I just want to read it more and more! Great review! I want to find out which one of these girls is good and which is evil! This sounds so amazing. * ^ * After reading your review I seriously just wanted to run to the nearest bookstore and just rob it from the shelves. That map is so breathtaking--COLORS! A map with colors! The whole idea of dividing people between of good and evil with the two schools sounds like such an original idea. I loved The School of Good and Evil! It was a really awesome book! And if you like reading about fairy-tale schools, have you heard of Ever After High? I just read it and it's quite good.